Cakes & Meetings And Meetings About Cakes! The last couple of days have just flown past! Mainly because it has included meeting so many GREAT people and doing so much food related activities (Both baking AND eating! 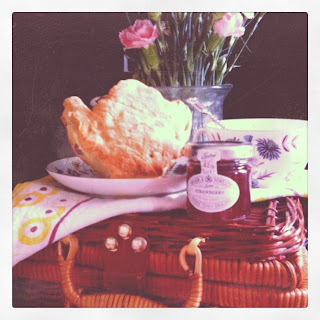 )…Generally having lots of fun picking up new Tea Party goodies along the way! I will share with you just some of the fun things that I got up to this weekend. Firstly, a little challenge between myself and my day-job colleague, Lina! I found a recipe from Mr Blumenthal for a 2 Ingredient Chocolate Mousse. Chocolate being one. Water being the other. She told me that this didn’t sound as though it would work too well. Challenge accepted! Hmmmm. Admittedly, I wasn’t sure it would work either! I decided to infuse the water with Earl Grey Tea, and it worked wonders. A very rich and thick mousse, not even I could finish a tiny pot in one sitting. I liked it. Some family members didn’t. So more for me! Saturday hosted two very important meetings for Miss Sue Flay. The first being the drop off of my very first Birthday cake with Let’s Go Punting in Cambridge! 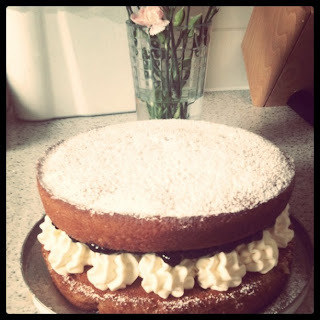 My Victoria Sponge with Forest Berry Jam, which went down very well indeed with the group of teenagers on this Punting tour! Hurrah! Myself and the lovely Caroline also planned and plotted for our collaboration, this being The Newly announced Secluded (Punting & Picnic!) 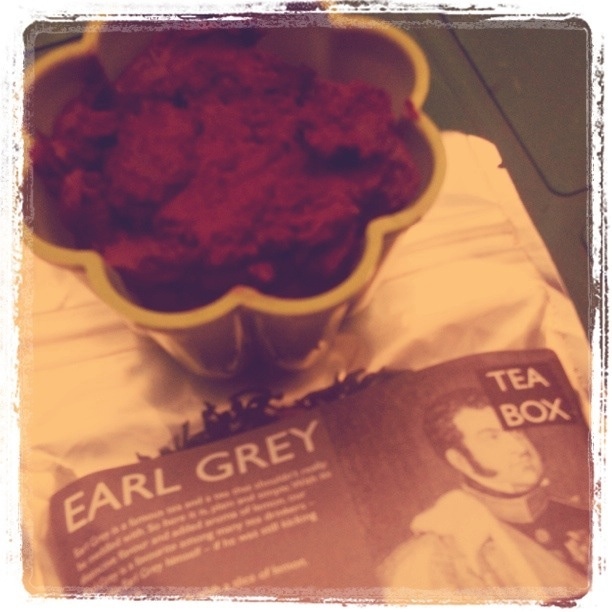 Tea Party on Sunday 14th August 2011. Very exciting indeed! The Second meeting was a very welcome chat and cup of tea with the lovely Claire Young, 2008 Finalist of BBC1’s show The Apprentice, and who has since set up organisations such as Girls Out Loud and School Speakers. Claire met with me at Chilford Hall where she was hosting an event, and she gave me half an hour of her time, where we sat and discussed my plans and ideas. Her advice was invaluable and I can’t thank her enough for the feedback she gave me. It has got me thinking in ways I had not even considered! She even sat and enjoyed one of my freshly baked scones, an added bonus to see that she enjoyed it! Check her projects out, they are very inspirational indeed! 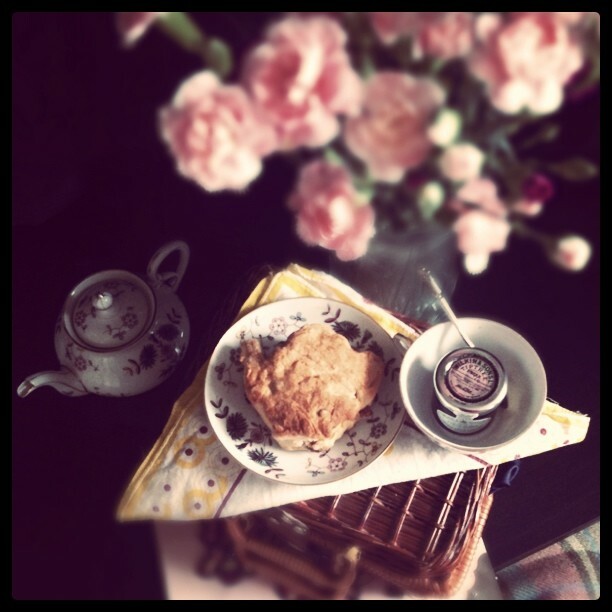 The scones I baked this weekend were a plain fruit scone, with a delicious cinnamon glaze. I used a new Teapot shaped cutter for these little beauties, and they were so cute I almost didn’t want to share them hehe! Everybody who tried these enjoyed them, even my mum, one of my very harshest critics! So needless to say these will appear on the Tea Party menu very soon. 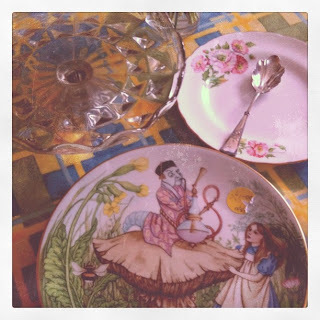 Sunday saw myself and the man friend heading to Hitchin Vintage Fair where I picked up a few goodies for The Tea party Table, as well as to see the stunning Kate Garner play live. I have been playing her music for a while on my Tea Party play list. In my usual style… I managed to completely miss her playing live and caught her just as she was leaving for home… DOH! But she was so charming and stayed for a quick chat which was great! I felt a little star struck if I am honest hehe! Kate has performed alongside the likes of Van Morrison, Roger Daltry and even Chas and Dave– Check her out! She has some brilliant gigs coming up. 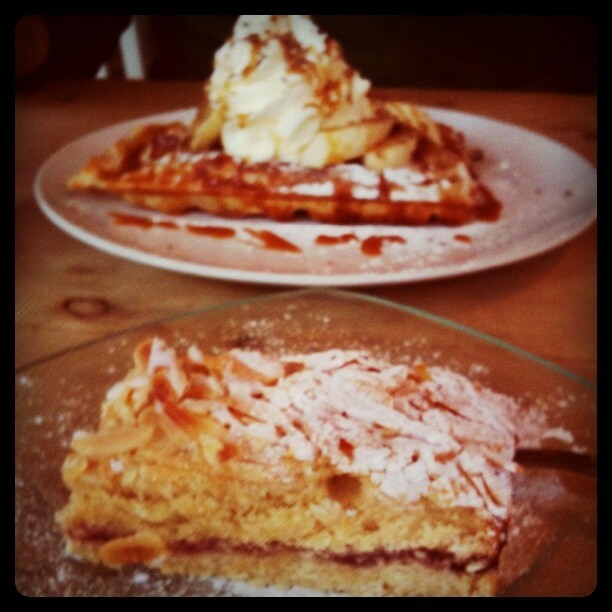 Whilst we were in Hitchin, we couldn’t resist enjoying an afternoon treat at the delightful Just Desserts on Bridge Street! 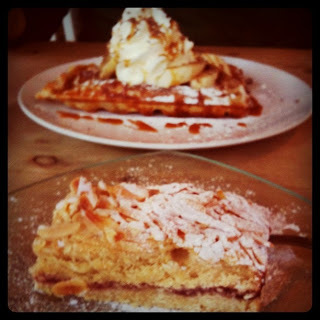 Mister had a Banoffee Waffle with lashings of cream and sauce.. but it was a little much for me to cope with, so I settled for a delicious Bakewell Slice which helped to satisfy a sweet tooth in a much smaller package! A lovely weekend with lots of plans and things to follow up with now! It never stops hehe… I love it! Haven’t popped in for a while, thought I’d drop in to say Helloooooo, loving the scones & oooh gorgeous new plates. Your delicious treats will look even more divine served upon such beauoootiful china. Aw thank you. 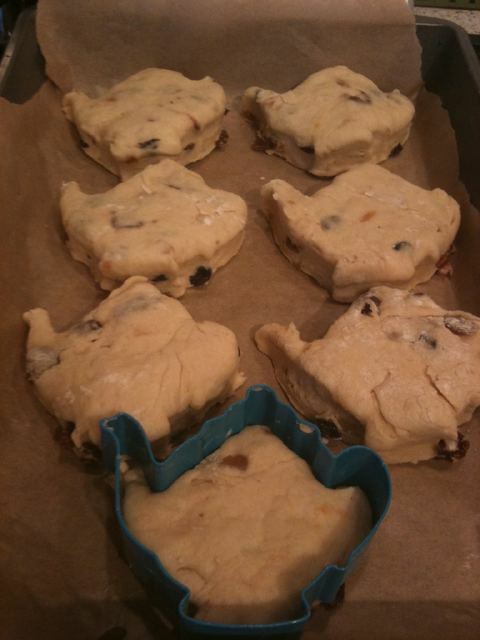 The Scones were even better tasting when shaped in such a fun way hehe. 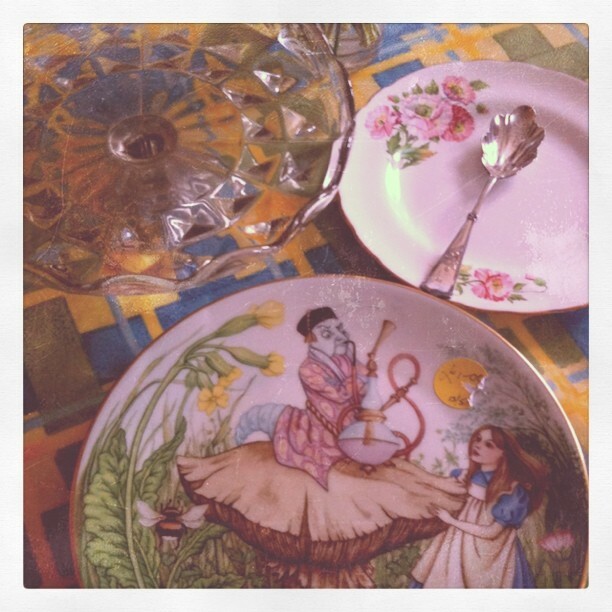 I love my Alice plate and the lovely cake stand… both absolute bargains! – Love a good bargain!